First published in 1887 in Beeton’s Christmas Annual, Sir Arthur Conan Doyle’s novel A Study in Scarlet introduced fictional super-detective Sherlock Holmes to the world – which has never been the same since. In total, Holmes appears in four novels, and fifty-six short stories, and since 1887 the Holmes stories have never been out of print, and remain the most circulated and translated books in the world – second only to the Bible. According to the Guinness Book of World Records, Sherlock Holmes is the most portrayed literary human character of all time, beating even Shakespeare’s Hamlet. Far less calculable is Sherlock Holmes’s impact on popular culture. The ghost of Sherlock Holmes is found in the modern obsession with police prodecurals and documentaries: the CSI franchise; the Law and Order franchise; Criminal Minds; House; 48 Hours; NCIS; Bones; Castle; Cold Case; The Mentalist; Monk; 21 Jumpstreet; Murder She Wrote; Columbo; Fringe; Dexter; The Twilight Zone; The X-Files; Harry Potter, in the highly logical Hermoine Grange; even Star Trek and Scoobie-Doo… to name a few. Holmes even shows up in the real world: forensic science didn’t exist in 1887, and many of the crime-solving techniques Holmes uses in the stories, like ballistics, chemical analysis, hand-writing analysis and autopsies, are now used by real CSIs all over the world. Frankly, you’d be hard pressed to take a criminal investigations course without hearing Conan Doyle, and Sherlock Holmes, be quoted, particularly his famous piece of wisdom: “It is a captial mistake to theorize before you have all the evidence. It biases the judgement.” Whether in culture or crime scenes, quite literally, Sherlock Holmes is everywhere. 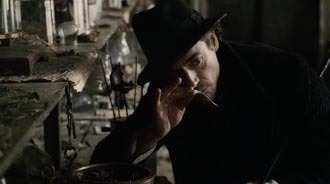 It is then no surprise Holmes and Watson re-emerge in Guy Ritchie’s 2009 film Sherlock Holmes, a film that is as much a period piece as a modernization of Sir Arthur Conan Doyle’s master detective. Though well received and financially successful enough to spawn a sequel, many critics and audience members questioned the many creative liberties Ritchie takes with Conan Doyle’s literary character. But like the illusions created by the film’s villain Lord Blackwood, the film only appears to stray from Holmes’s heritage. Ritchie re-presents Sherlock Holmes in order to distill his purest form, creating a film whose structural design not only imitates and materializes Holmes’s famous powers of deduction, but reveals why Holmes continues to haunt the popular imagination. Honestly I’ve never fully understood or prescribed to the popular opinion that “the book is always better” (though it is certainly always different), or that fictional characters cannot change. And while I understand the spirit of the argument, something about bickering over what is ‘true’ or ‘untrue’ about a fictional creation strikes me as a little silly. 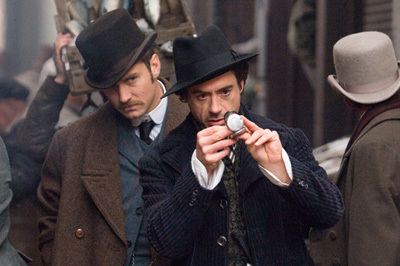 But I find Louise Keller’s comment the film violates the “essence” of Sherlock Holmes interesting. Interesting because, to begin with, I believe continuity is everybody’s favourite imaginary friend which doesn’t actually exist in any meaningful way. Particularly when it comes to a character like Sherlock Holmes, who has, at this point, been portrayed, referenced, quoted and alluded to so many times he’s the world record holder. And as far as referring to “The Canon” (capital letters required!) of Conan Doyle’s original stories… well, truth is Conan Doyle didn’t take Holmes seriously enough to care about continuity either. 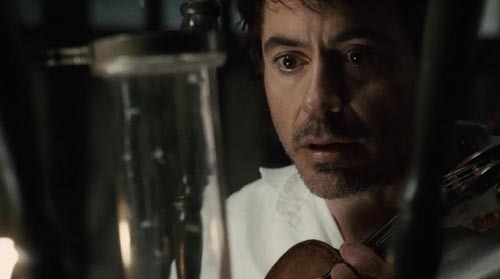 In A Study in Scarlet, Watson, trying to deduce Holmes’s profession shortly after moving into Baker Street, makes a list of Holmes’s various areas of knowledge. 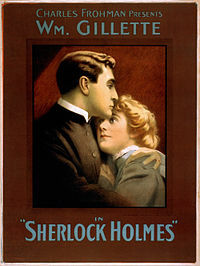 Under a list titled “Sherlock Holmes – his limits,” listed first is “Knowledge of Literature” beside which Watson marks “Nil.” Even though throughout the “Canon” Holmes quotes no less than 14 Shakespeare plays (including Henry V from which the famous “the game’s afoot!” derives), Goethe’s Faust, Gustave Flaubert, and Henry Thoreau, which would beat most English majors I know. And not unlike Ian Fleming’s failed attempt to kill James Bond at the end of From Russia With Love, Conan Doyle also famously tried to murder his own creation in the short story The Final Problem at the hands of Professor Moriarty. Like Fleming, Conan Doyle was persuaded by public outcry, and the heated protests of his own mother, to resurrect Holmes in The Adventure of the Empty House. Other so-called “authentic” Holmes traits derive from a Sherlock Holmes play Sir Arthur Conan Doyle wrote, which premiered in 1899 and starred famous stage actor William Gillette. Gillette’s protrayal of Holmes perpetuated most of the elements we now take for granted as synonymous with Holmes. Gillette revised Conan Doyle’s script so heavily little of the original remained in the final production. From Paget, Gillette borrowed the deerstalker and cape, wearing them on stage, and it was Gillette who swapped Holmes’s straight pipe (and cigarettes), to the now infamous bent, briar pipe. 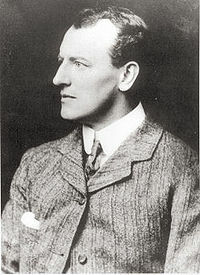 Gillette was the first to say to Watson “Elementary, my dear fellow,” later reused and revised in the 1929 silent film The Return of Sherlock Holmes starring Clive Brook as “Elementary, my dear Watson.” There are also other inconsistencies with Conan Doyle’s works which litter the many adaptations of Holmes. Claudia Puig may lament Watson is “no longer a bumbler. He’s a marksman, a risk-taker and a romantic gent” but she does so without realizing that Watson “the bumbler” was the design of Nigel Bruce’s Watson, and the “marksman, risk-taker, romantic gent” is the Watson of Conan Doyle’s stories: Holmes often relies on Watson to be his armed protector; he sends Watson on dangerous missions alone (often without fully explaining the situation to him), as when he sends Watson to protect Sir Henry Baskerville from a murderous plot in The Hound of the Baskervilles; and Watson not only falls in love and marries (twice), but is forever commenting on the beauty and loveliness of the women who rotate in and out of 221b Baker Street seeking Holmes’s advice. There is also the repeated strange choice to make Holmes an older, severe looking fellow in most adaptations, when he’s never described that way by Conan Doyle and, by various references, cannot be older than a very young 33 when the stories begin. At heart the obsessional insistence on continuity is a misguided belief in authenticity: that there are traits, situations, responses and quotes which are Sherlock Holmes, and others which are not, and all of the things which are can be found in the original texts. 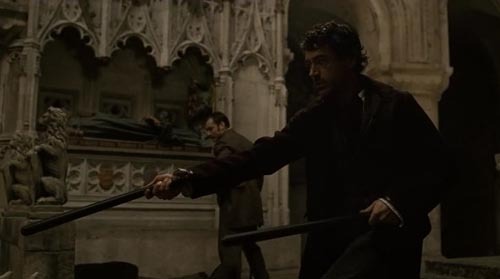 The lamentation that Sherlock Holmes feels like a buddy film comes from the judgement Conan Doyle’s stories don’t read like a Lethal Weapon movie, so the “buddy” vibe isn’t authentically Holmes. But this is to ignore the extent to which the literary duo of Holmes and Watson influenced the buddy-cop films which came half a century later. Faulting Sherlock Holmes for borrowing from Butch Cassidy and the Sundance Kid conveniently forgets the extent to which Butch Cassidy borrows from Holmes. Making Sherlock Holmes a “buddy” movie doesn’t violate the “Canon,” it is to acknowledge the living legacy of Sherlock Holmes. It is to trace Holmes’s influence, inspiration, and many guises throughout popular culture. 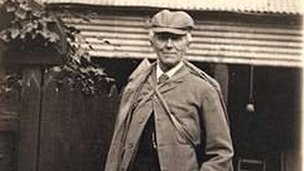 It is to remind us that Holmes is not, as critic Tim Grierson somewhat inexplicably describes, “a dusty literary icon,” but very much alive in the popular imagination. Kyle Smith may wonder condescendingly “Who the deuce decided to filter Sherlock Holmes through Batman & Robin?” but it was Bob Kane: Batman’s creator – Batman, “The World’s Greatest Detective,” is Sherlock Holmes. All art is interrelated in such complex and tightly woven ways it is sometimes invisible, but no work, no work, is an island unto itself: Sherlock Holmes is as much Poe’s Dupin as House, Jessica Fletcher, or CSI Gil Grissom is Holmes. Fictional characters who survive in the cultural imagination this long are not antiques whose appraisal increases with age, petina, and “purity” to the original: they survive because they are dynamic: Holmes is, after all, a master of disguise. 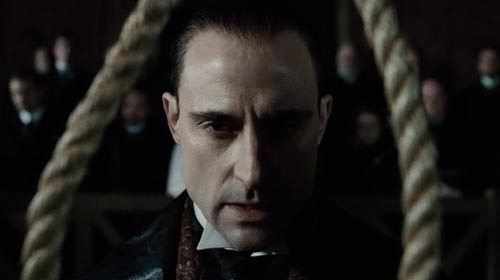 Louise Keller’s condemnation Ritchie’s film betrays the “essence” of Sherlock Holmes confuses the surface, shallow trappings of character (the habits of dress, the physical description, repeated quotations), with a character’s spirit: their purpose and the spiritual wishes they fulfil in our imaginations. 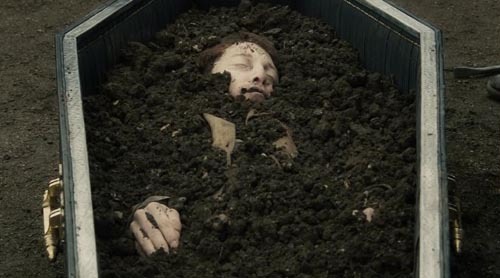 Perhaps what Ritchie is doing with this “cavalier” revamping in Sherlock Holmes is not to throw Holmes away, but to, as Ritchie describes, create a Holmes “not contaminated by previous symbols” which drip with the surface trappings of character, in favour of a film which strips away the traditional assumptions about Holmes precisely to distil and animate Holmes’s real essence. That Sherlock Holmes continues to be a relevant figure in culture is perhaps surprising when you stop to consider the extent to which he is an absolute emblem of the Victorian Era. 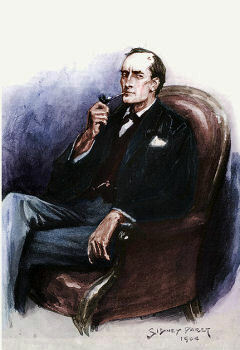 Appearing first in 1887, Holmes emerges at the tail end of the Industrial Revolution in England. The subsequent exponential growth in the urban population of London brought with it a rise in crime, in particular because with the growth of industry there was an increased opportunity for theft and embezzlement, an increase in potential gains for criminal activity and likewise potential losses for companies. Because of this, in 1829, British prime minister Robert Peel established the Metropolitan Police Service (incidentally, why police officers in England are sometimes called “Bobbies”) to serve the entire urban area of London, as historically, “police” were private watchmen. There was also a reform of criminal law, where many former torts (an act which unfairly causes harm to another which is not illegal but allows the harmed party to recover their losses) were criminalized and the amount of capital offences increased, as did the state’s ability to search and arrest. The detective department of the MPS wasn’t created until 1842, and by 1848 there were only 8 plain clothes detectives in all of London. However, the 1869 creation of the National Criminal Record (which kept records of an individual’s criminal history) and the introduction of the telegraph in 1867 which sped up communication, both dramatically increased the effectiveness of detectives and by 1883 there were 800 of them. While Holmes is not officially related to the police service, being a “consulting detective,” this was still a relatively new concept and criminal investigation was in its infancy, making Holmes not only a novelty in his deductive process but an absolute prophecy of the future of criminal investigations. 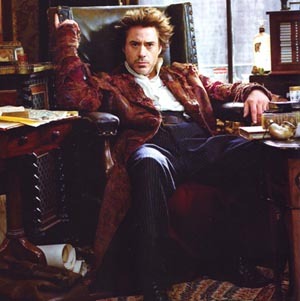 But Holmes is not just a detective, he is an heir to the legacy of the Enlightenment. The Enlightenment was an intellectual revolution in the 17th and 18th centuries whose purpose was to reform society with reason, and to challenge the reigning paradigm of thought which relied heavily on tradition and faith. Historian Jonathan Israel argues until the mid 17th century, Western civilization “was based on a largely shared core of faith, tradition and authority.” The Enlightenment championed reason, science and skepticism over theology, superstition, intolerance and the abuses of the church and state. Israel viewed the Enlightenment as a “general process of rationalization and secularization … which rapidly overthrew theology’s age-old hegemony in the world of study.” The major contribution of the Enlightenment was the encouragement of applying rationality to every problem, rather than always filtering through faith or dogma. This is important because the Enlightenment itself began in the final days of the so-called Scientific Revolution of the 16th and 17th centuries where new ideas and scientific methods flourished and began to destabilize the dominance of the church: for example, the acceptance that the Earth is not the centre of the universe, the discovery that matter is made up of empty space and atoms rather than the four elements (earth, water, air, fire), and later, Darwin’s theory of evolution. Many Enlightenment thinkers were scientists or had scientific backgrounds and they saw science as a way to overthrow religious and traditional authority. As a result, the Enlightenment popularized science and its theories as the population became increasingly literate, most notably with the publication of the Encyclopédie, filled with contributions from the Enlightenment’s most important thinkers and whose purpose was literally to change the way people think and how they thought about the world around them. But while Holmes himself reliably lands on the side of reason every time, the stories still betray an enchantment with the supernatural, spiritual realm. 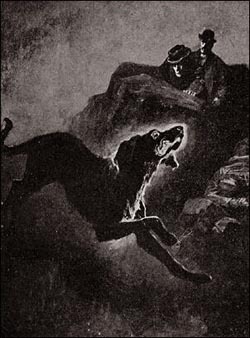 ‘The Hound of the Baskervilles’ is easily the most atmospheric in the Holmes library and it’s narrative prose is borderline gothic. And not unlike Jude Law’s Watson in Ritchie’s film who cautions Holmes Blackwood’s apparent resurrection could indeed be supernatural, in ‘The Hound of the Baskervilles,’ Conan Doyle’s Watson also gives way to spiritual thought. Hearing someone screaming late at night on the moor, Watson and Holmes rush towards the sounds: “A low moan had fallen upon our ears. … As we ran towards it the vague outline hardened into a definite shape. It was a prostrate man face downward upon the ground, the head doubled under him at a horrible angle, the shoulders rounded and the body hunched together as if in the act of throwing a somersault. So grotesque was the attitude that I could not for the instant realize that the moan had been the passing of his soul.” If Conan Doyle’s hero never catches the Victorian trend of the supernatural, his stories surely do, and if Holmes represents the era’s championing of exact rationality, the film’s occultist, black magic priest and villain Lord Blackwood, is Holmes’s perfect counterpart. Another important thread in Victorian life which informs Lord Blackwood, was the Victorian fascination with secret societies, which also make several appearances in Conan Doyles Holmes ‘Adventures.’ Two of the four novels, A Study in Scarlet and Valley of Fear, feature secret societies (or as the Freemason’s would say, ‘societies with secrets’). Short story ‘The Five Orange Pips’ deals with an ex-KKK member, and ‘The Adventure of the Red Circle’ deals with a pair of lovers fleeing the dangerous leader of the Red Circle, a secret criminal organization they betrayed. And many more of the stories make use of ciphers and hidden symbols like ‘The Adventure of the Dancing Men.’ And so, the accusation that Ritchie’s film “knocks-off” Howard’s The Da Vinci Code is not entirely fair. 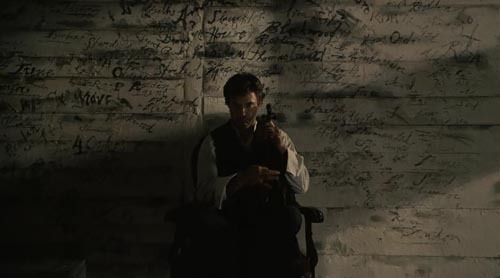 Aside from their appearance in Conan Doyle’s canon, the film’s attachment to secret societies and layered symbolic systems is historically accurate and not unrelated to the film’s devotion to the supernatural and the occult. 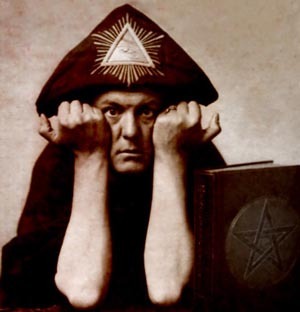 Blackwood is loosely based on Aleister Crowley, an occultist and black magic “priest” who was dubbed “the wickedest man in the world.” Crowley was deeply interested in black magic and had many ties to “secret societies:” he was a former Freemason and a member of The Hermetic Order of the Golden Dawn (on which the film’s Temple of the Four Orders is based). As an expression of rebellion against the moral and religious values of the time, Crowley created the religious philosophy Thelema. The basic teaching of Thelema is “Do what thou wilt,” and its practice was the ritualistic use of magic. Thelema is, importantly, based on spiritual experiences Crowley and his wife Rose had while in Egypt and much of Thelema’s rituals, beliefs, and deities are Egyptian in origin. 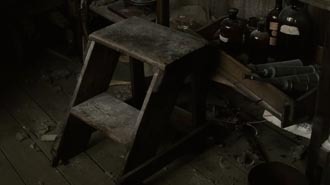 The film also makes allusions to Freemasonry, who are primarily secretive about their rituals, and use gestures, handshakes and passwords to gain access to meetings; however, their focus is charitable work, moral uprightness and fraternal bonds (there are no female members). But the Freemasons have long been suspected in conspiracy theories as many men of power and great political influence (including more than a few American presidents) have been members. The most famous conspiracy theory involving Freemasonry is, perhaps, found in the theory Jack the Ripper was a Freemason. The film’s Temple of the Four Orders is closest, however, to The Hermetic Order of the Golden Dawn, which was at the height of its popularity in the 1890s. The Hermetica are Egyptian-Greek wisdom texts from the 2nd and 3rd centuries which teach oneness with God. A repeated maxim in Hermetic belief systems is “as above so below,” and urges the purification of the soul. Hermetism sees wisdom as comprising three parts: alchemy, astrology, and theurgy (magic, which can be black or divine). The Golden Dawn was founded by three Freemasons and was one of the largest single influences on 20th century occultism which borrows heavily from Hermetism’s treatises on alchemy and magic. 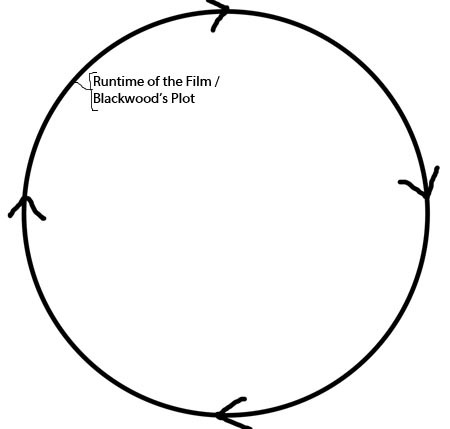 Neither does the film invent the system of symbols on which Blackwood builds his plans. 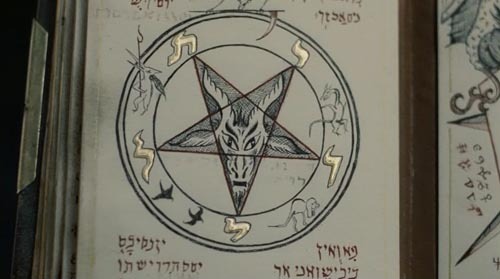 Occultist icon Baphomet makes several appearances in the film, particularly in Blackwood’s book of spells. Baphomet was a critical occult symbol in the Victorian Era, created in 1851 by occultist Eliphas Levi, it’s essentially a collection of symbols important to Hermeticism, Kabbalah and alchemy in order to emphasize the fundamental principles of occultism. For instance Baphomet is usually pictured with arms pointing up and down to illustrate “as above so below,” and images of Baphomet usually incorporate some representation of the four elements. Baphomet later became synonymous with Satan (“the goat”), but first was of central significance to Aleister Crowley’s Thelema. Importantly, Levi described Baphomet as a sphinx as it is a fusion of many creatures into one being. As a symbol, the sphinx is important in Crowley’s Thelema, the Golden Dawn, and, although only recently, in Freemasonry. The Victorian Era also saw a resurgent interest in all things Egyptian, also reflected in the Egyptian influence in Thelema. And so the reliance on the sphinx in the film is wholly appropriate. Baphomet’s creator Eliphas Lévi wrote about the sphinx extensively, as did Aleister Crowley (who claimed to be the reincarnation of Lévi). In the Greek tradition the sphinx has the haunches of a lion, the wings of a great bird, and the face of a woman and is a treacherous and merciless figure; whereas in the Egyptian tradition the sphinx is typically a man and is considered benevolent and seen as a guardian to other dimensions. So too must Blackwood create the illusion he has supernatural forces under the control of his will. To this end, Blackwood uses the Order’s belief in the power of the sphinx to not only convince his fellow Order members of his powers, but also the public. Each of the three murders Blackwood commits after rising from the dead, and the mass murder he attempts in Parliament, correspond with the four creatures who comprise the Hermetic sphinx: Reordan, “the ginger midget,” represents man; head of the Order Sir Thomas Rotheram represents the ox as he bears its symbol on his ring; Standish, the American Ambassador represents the eagle, as Holmes explains since the eagle is “a national emblem” in the USA; the fourth intended murder of Parliament members is thus represented by the lion, as the eagle is to America so the lion is to the English. But Blackwood does not simply recreate the imagery of the sphinx in the murders. Lévi also links the four powers of the sphinx with the four natural elements: “You are called to be king of air, water, earth and fire … He who aspires to be a sage and to know the Great Enigma of Nature must be the heir and despoiler of the sphinx: his the human head, in order to possess speech; his the eagle’s wings, in order to scale the heights; his the bull’s flanks, in order to furrow the depths; his the lion’s talons, to make a way on the right and left, before and behind.” The murder of Reordan corresponds with the element of earth as his body is found in Blackwood’s coffin covered in dirt, and the element’s corresponding sphinx power ‘keep silent’ as Blackwood murders Reordan to cover up his plans (and the very rational source of his ‘supernatural’ powers). 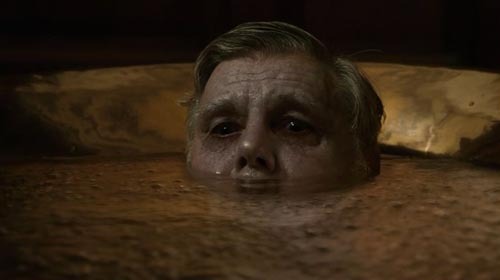 The murder of Sir Thomas conforms with the elements of water as he is found drowned in his bathtub. 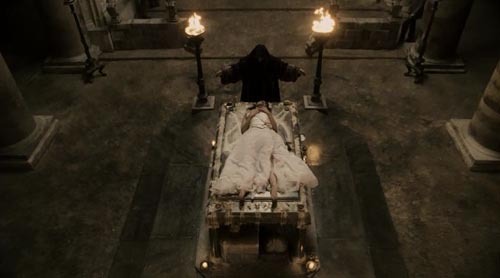 The corresponding sphinx power to water is ‘dare,’ which certainly describes the audacity it took for Blackwood to kill the head of the Order he intends to control himself, but also his own father. 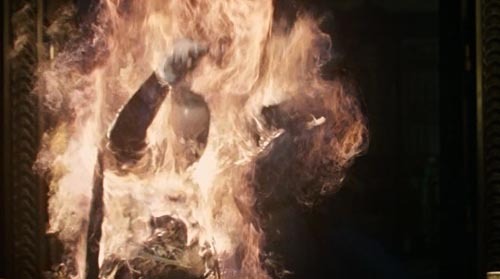 Standish’s murder correlates with the element of fire, as he bursts into flame after attempting to shoot and kill Blackwood. Fire’s matching sphinx power is will: unbeknownst to Standish, Blackwood has soaked him in a flammable substance and replaced a bullet in his gun to give off sparks as a source of ignition, so Standish is killed by his own will to stop Blackwood, as in turn, he appears to die by Blackwood’s will alone to the unsuspecting Order members watching. Lastly, the planned mass murder in Parliament is at least supposed to make use of the final element, air, as a machine in the sewers beneath Parliament intends to create cyanide gas which will travel through the ventilation system into Parliament chambers and poison the air. Likewise, air’s coinciding sphinx power is to know, and it is through this act Blackwood’s supernatural powers will be proven and known both to his Order followers (who have unknowingly been given the antidote) and the whole of England. For Crowley, who took Lévi’s teachings of the sphinx and expanded them, the sphinx is a symbol of wholeness, and to the four powers adds a fifth: to Go. This power corresponds with the element of the Spirit and binds the four powers of the sphinx. At its essence ‘to Go’ underlines the importance of being dynamic and resisting the static, as Crowley explains, “For if there were some form of Being separate from Going, it would necessarily be subject to decay.” To Go corresponds with the spirit, therefore, as the ‘essence’ of Godliness is immortality, which Crowley sees as continual rebirth, change and energy. 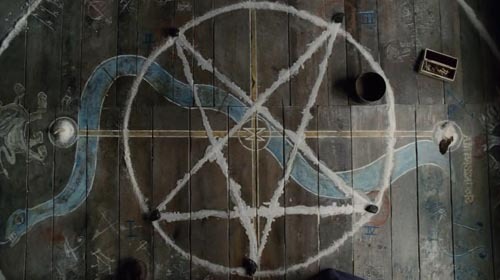 The pentagram, another symbol repeatedly used in the film (and which, along with the cross, Holmes uses to decode the location of Blackwood’s last act), correlates with Crowley’s five powers of the sphinx as the five points of the star represent earth, water, fire, air and spirit. 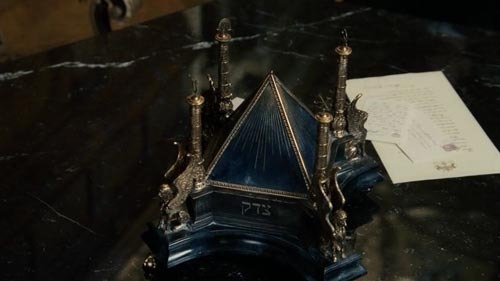 Using this system, Blackwood presents himself as a supernatural being by using the four powers of the sphinx, and their corresponding elements in his plot, but also incarnates Crowley’s fifth power as he appears immortal when he rises from the grave. 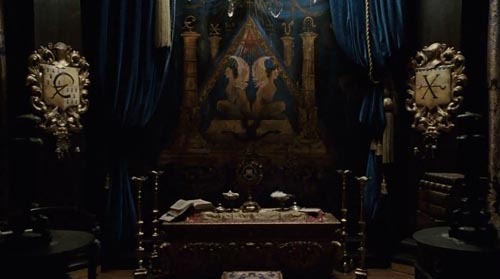 As a recurring, central symbol in the film, the sphinx is not just relevant for its importance in the various secret societies the film references. In the Greek tradition, the sphinx sits outside of the city of Thebes and stops travellers on the road. The sphinx then poses a riddle for admission to pass into the city, and the penalty for an incorrect answer is death. The “riddle of the sphinx” in Greek mythology is how the sphinx became synonymous with mystery. What is the purpose of a detective but to untangle the riddles of unexplained events, the mysteries of human action and motivation. And mystery narratives are indeed constructed as riddles, where part of the intrigue is to try decipher the puzzle of what happened as, or even before, the detective does. 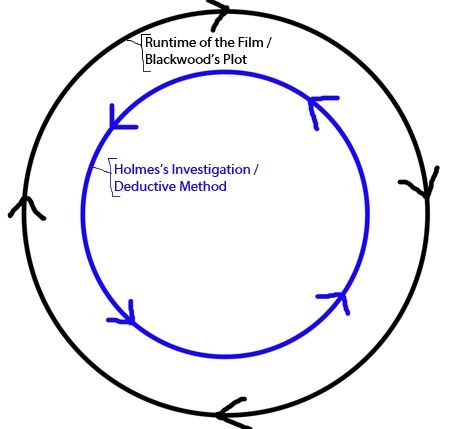 Not only does Sherlock Holmes revolve around the essential function of the detective to unravel riddles with the power of reason, but the film’s structure mimics Holmes’s deductive process. And not unlike the most devious riddles that hide all the clues needed to realize the answer within the question itself, the film likewise embeds the “key” to deciphering, not the mystery which serves as the film’s plot, but Holmes’s essence. 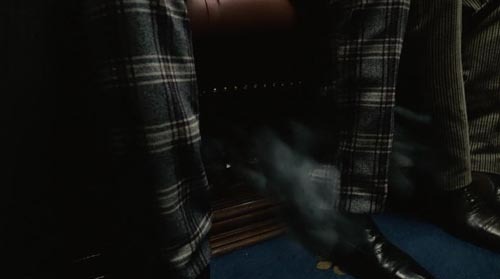 Sherlock Holmes also makes extensive use of flash-fowards, or what Hans Zimmer (the composer of the film’s score) more accurately describes as pre-visualizations. Of course these are not strictly “counter-clockwise,” but neither are they chronological as they “skip” ahead in time. It is here, however, that the film’s structure as a set of concentric circles begins to be visible. 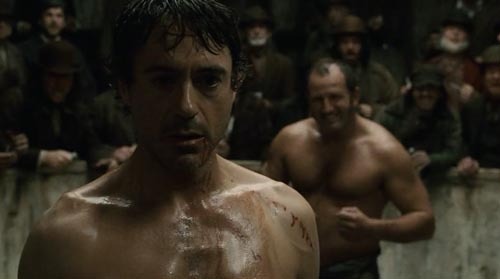 Most of the pre-visualizations in the film are connected to fight sequences wherein Holmes visualizes and plans out his attack in order to quickly subdue his opponent. 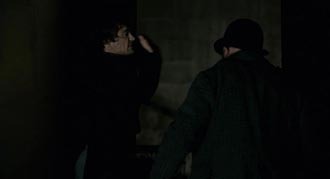 These fight sequences were the single most troubling element in the film for many critics and audience members to accept as being a genuine Holmes trait. Yet, it’s not actually something Ritchie made up, and neither is it superfluous. 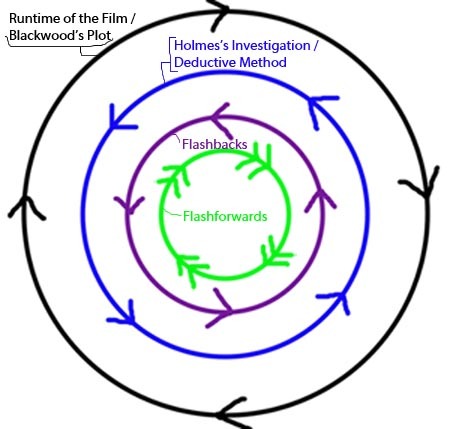 In fact, the fight sequences are as representative of Holmes’s deductive process as the flashbacks (and perhaps more). It even shows up in Conan Doyle’s canon. In A Study in Scarlet, Watson makes note in his list of Holmes’s abilities and limits he is “an excellent singlestick player, boxer, and swordsman.” In A Sign of Four, Holmes and Watson are allowed into Pondicherry Lodge by the estate’s footman and “prize-fighter” McMurdo only after Holmes reminds McMurdo he is “the amateur who fought three rounds with you at Alison’s rooms.” McMurdo responds enthusiastically “Not Mr. Sherlock Holmes! … God’s truth! How could I have mistook you? If instead o’ standin’ there all quiet you had just stepped up and given me that cross-hit of yours under the jaw, I’d ha’ known you without question. Ah, you’re one that has wasted your gifts.” The film’s credits reveal McMurdo is the man Holmes faces in the “fight club.” In The Adventure of the Solitary Cyclist Holmes gets into a barfight with Mr. Woodley who overhears Holmes asking the locals for information about him, Holmes escapes the fight with a few bruises while Mr. Woodley is sent home “in a cart.” Watson also refers to Holmes in The Yellow Face as “one of the finest boxers of his weight,” and admits in The Adventure of Lady Frances Carfax that he himself has “held [his] own in many a struggle.” So it isn’t so non-canonical after all. Of particular importance to the film is the martial art Holmes calls ‘baritsu,’ when he explains to Watson in The Adventure of the Empty House his mastery of the art is what allowed him to overcome Professor Moriarty in their struggle at Reichenbach Falls. Baritsu is almost certainly a misspelling of Bartitsu, a martial art popular in the late 19th century, which was developed by E.W. Barton-Wright, an engineer who had lived in Japan for 3 years. 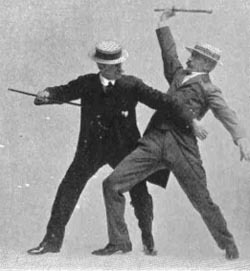 Bartitsu is a combination of many fighting styles into what Barton-Wright described as a “unifed whole.” Its influences include boxing, wrestling, ju-jutsu, Swiss schwingen, and French savate (stick fighting) and is the earliest example of mixed martial arts. It was very popular in Victorian London and there were several Bartitsu clubs, where it was seen as “self-defence for the gentleman.” A lot of the characteristic techniques of Bartitsu makes use of items a typical “gentleman” would be wearing, for instance distracting the attacker by throwing their hat, using their overcoat to entangle the opponent and making use of their walking stick. 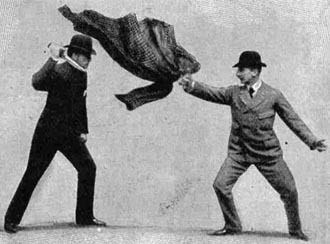 Richard Ryan, the film’s fight choreographer, calls Holmes’s fighting style “neo-Bartitsu,” a more modern interpretation of Barton-Wright’s techniques which also combines Chinese boxing called Wing Chun and Brazilian Jujutsu, though signature Bartitsu moves are used in the film including several uses of an overcoat to entangle an opponent and using a thrown handkerchief as a distraction (the fight sequences in the film’s sequel, A Game of Shadows, is a closer resemblance to historical Bartitsu). 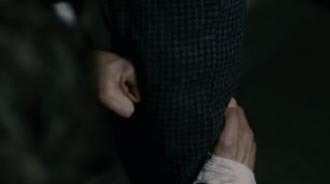 Significantly, the pre-visualizations do not appear to occupy any time: for instance when Holmes plans his attack on McMurdo, the pre-visualization takes longer screen time than appears to pass in real time: Holmes, to the crowd, would not appear to have hesitated for more than a second as when the visualization ends the film cuts back to Holmes immediately after his train of thought begins. 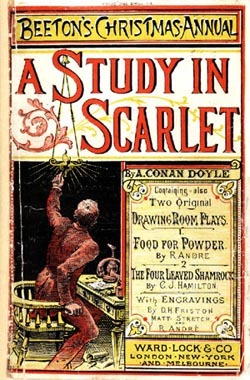 In the Conan Doyle stories, Holmes often describes the train of thought which lead to his conclusions but is always careful to point out because, as he explains in A Study in Scarlet “Observation with me is second nature,” Holmes thinks so quickly it appears to be more of an instinct than a deduction. Upon meeting Watson for the first time, Holmes remarks to Watson that he’s been in Afghanistan, later Holmes explains that he hadn’t been told, rather: “I knew you came from Afghanistan. From long habit the train of thought ran so swiftly through my mind that I arrived at the conclusion without being conscious of intermediate steps. There were such steps, however. The train of reasoning ran, ‘Here is a gentle man of a medical type, but with the air of a military man. Clearly an army doctor, then. He has just come from the tropics, for his face is dark, and that is not the natural tint of his skin, for his wrists are fair. He has undergone hardship and sickness, as his hagard face says clearly. His left arm has been injured. He holds it in a stiff, unnatural manner. Where in the tropics could an English army doctor have seen much hardship and got his arm wounded? Clearly in Afghanistan.’ The whole train of thought did not occupy a second.” As if to underline the absence of a conscious train of thought, the flashforwards are filmed in bullet-time to emphasize the speed of his perceptions and observations. 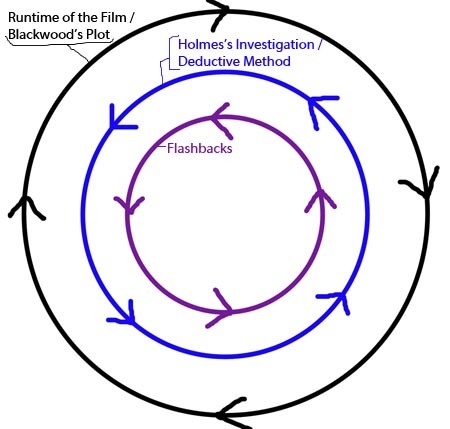 In this way the pre-visualizations are counter-clockwise in the sense that they stretch and manipulate real-time, and also mimic the subjective experience and temporality of Holmes’s mental process. This outer layer is the only one which is strictly clockwise, each subsequent inner circle represents a further distortion of time. What makes a set of circles concentric is that they share the same centre. In the film this centre is surely Holmes whose investigation, deductive process and perceptions form the essential structure of the film.